Tiffany & Co. is synonymous with beautiful diamonds, but the brand also has a long and intimate relationship with a wide array of coloured gemstones. In fact, it celebrated its long romance with coloured gemstones last year with the launch of a special high jewellery collection called Vivid Dreams, The Extraordinary Colors of Tiffany. As the second stop in this collection’s global tour, Tiffany & Co.’s boutique at ION Orchard will be transformed to proudly display the 84-strong collection, together with 35 archival pieces ranging from delicate kunzite brooches from the 1900s to the archival Blue Book Paloma Picasso platinum and gold necklace made of nine different gemstone varieties. These exquisite creations, and the vividly coloured stones that adorn them, can be seen in their full glory at the boutique by the public on April 8. Tiffany & Co.’s exceptional coloured gemstone pieces have been integral in building the jeweller’s sterling reputation over the years. One of the fundamental coloured gemstones in Tiffany & Co.’s repertoire is the kunzite. A lilac–pink stone that appears as gentle as it is brilliant, it found its way from California into the illustrious catalogues of Tiffany & Co. in the early 1900s. The eponymous kunzite was found in California by George Frederick Kunz, a famous American mineralogist who went on to become the vice president of Tiffany & Co. at the age of 23. If the kunzite’s gentle nature appeals to you, the graceful pink tones of the morganite will surely tickle your fancy. This gem can range from light pink to slightly orange when untreated, and its shimmering pink hues bring an understated elegance to any ensemble. This innately glistening violet–pink beryl was first found in Madagascar, also by Kunz, and was subsequently introduced by Tiffany & Co. in 1910. John Pierpont Morgan, a prominent figure during the ultra-decadent Gilded Age, was a devotee of the peerless morganite and a lifelong patron of Tiffany & Co. Morgan commissioned Kunz to assemble several important gem collections — and his name was eventually bestowed on the eponymous morganite. Since then, morganite has been a mainstay in the boutique’s catalogues. Other striking coloured gems include the tanzanite, an entirely new species of gemstone that was discovered in the 1960s at the foothills of Mount Kilimanjaro in Tanzania, the gem’s only known source. The embodiment of glamour and style, the bold hue of tanzanite encapsulates the depth of the ocean and the vastness of the midnight sky. 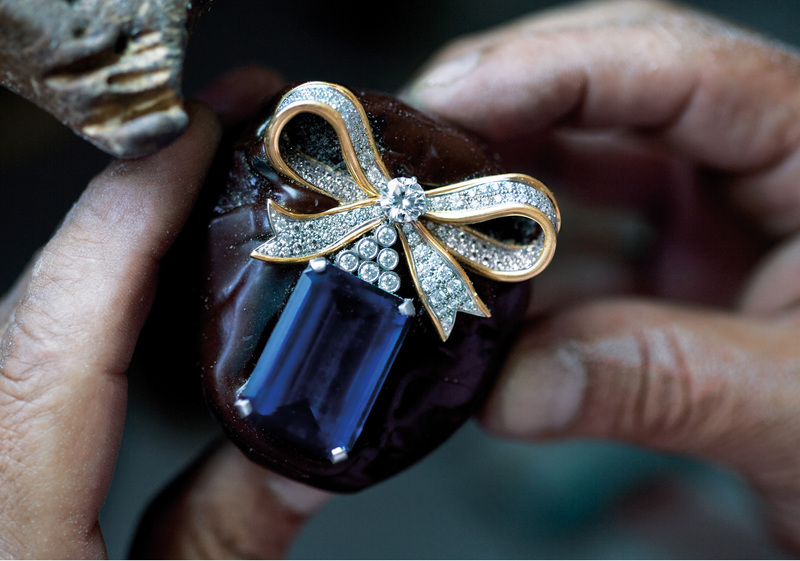 The discovery of tanzanite was also cause for much celebration at the time, as it was the first new transparent blue gemstone to be found in hundreds of years, making this among the rarest and most treasured gemstones in the Tiffany & Co. vaults today. The tsavorite, with its intense green hue, has an incomparable colour that lends dramatic flair to every piece it decorates. Tsavorite is, in fact, a very rare type of garnet that is distinguishable by its rich verdant glow, and derives its name from the Tsavo National Park that borders Kenya and Tanzania, where the gem was first found in 1970. Shortly after the intense green gem was discovered, Tiffany & Co. began using it in exquisite jewellery pieces, solidifying tsavorite’s reputation as an exceptional coloured gem. These four gems are but an exceptional selection among the plethora of gemstones that Tiffany & Co. has worked with over its illustrious history. They have made an indelible mark on the jeweller’s catalogues over the years, and will surely continue to grace the brand’s creations for years to come. Vivid Dreams, The Extraordinary Colors of Tiffany opens to the public on April 8 at Tiffany & Co. ION Orchard.